doug: Watch the New Westminster concourse come to life! Over the next few weeks you will see various events occur in the concourse. The new student common area steel structure will expand, and preparation for the new linoleum installation on levels 3 & 4 is in progress. 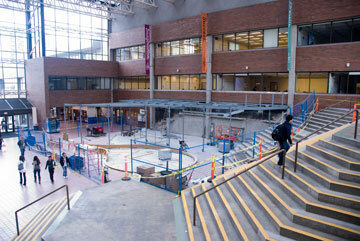 Look for the stage area to take shape after the concrete is poured next week. Watch for further updates, as access in this area may be restricted during the concrete delivery/pour. Sorry for the inconvenience! In the meantime, follow the progress on Flickr!